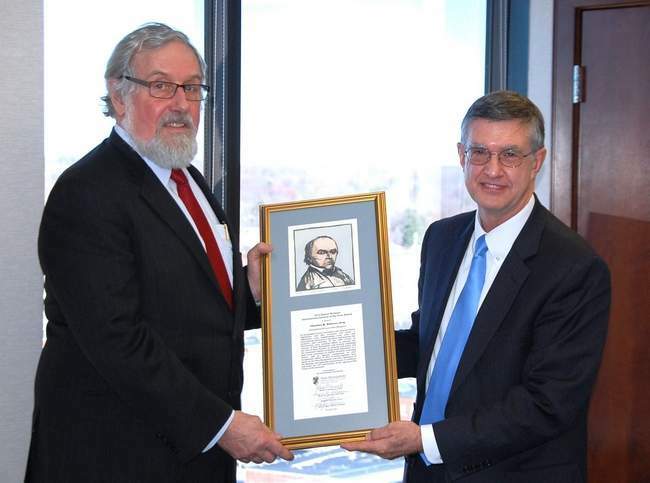 International Section of the NH Bar Association Honors Charles Doleac, Esq. Cheney commented, “One cannot underestimate what Chuck has done. In 1988, he founded the Japan-America Society of New Hampshire and throughout 1990’s was the prime mover in organizing a series of four peace treaty forums with scholars and dignitaries from Russia, Japan and the US. “That was just the beginning of his efforts to educate the citizens of NH and beyond regarding the significance and continued validity of multi-track diplomacy,” he continued. Attorney Doleac had a lead role in the 100th and 105th anniversaries of the 1905 Treaty of Portsmouth – which enjoyed broad support on the seacoast and helped to spin off documentaries, school curricula, the Portsmouth Peace Treaty Trail, and a new NH statute that each year now honors September 5 as “Portsmouth Peace Treaty Day.” In 2011, for these efforts the Emperor of Japan awarded him the Order of the Rising Sun, Gold Rays with Rosette. 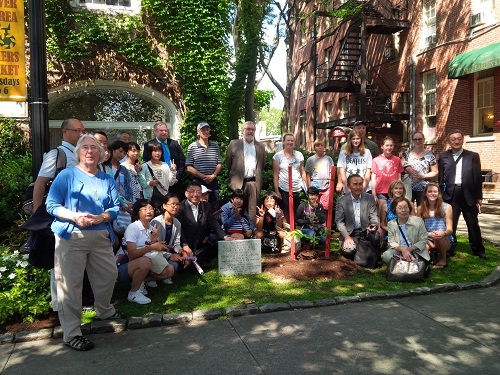 participated in the planting of Hanover's cherry tree in honor of Kan'ichi Asakawa. Portsmouth, New Hampshire -- The large cherry trees that bloom so abundantly each spring at City Hall Portsmouth were planted in 1985, thanks to a gift from Nichinan, Japan – Portsmouth’s Sister City and the hometown of Baron Jutaro Komura, the lead Japanese diplomat at the 1905 peace conference that led to the Portsmouth Peace Treaty ending the Russo-Japanese War. Portsmouth Peace Treaty Living Memorial trees are located in Portsmouth surrounding the South Mill Pond at City Hall and in front of the Portsmouth Middle School, at Wentworth By the Sea Hotel, the Portsmouth Naval Shipyard and in the Community Garden at Strawbery Banke Museum. Commemorate Portsmouth Peace Treaty Day on September 5th with bell-ringing at 3:47 pm. Hanover – where Japanese student Kan’ichi Asakawa attended Dartmouth College. He later wrote The Causes of the Russo-Japanese War and was funded by Dartmouth President William Tucker to travel to Portsmouth to observe the 1905 peace conference. Tree is located at Hanover Town Hall. Dublin – where Japanese Ambassador and public affairs liaison Baron Kentaro Kaneko frequently visited residents and G. B. Putnam & Sons publisher Joseph and Corinna Smith, whom he had met as friends of Theodore Roosevelt in 1901. Tree is located at the Dublin Historical Society Schoolhouse Museum. Manchester – where Baron Komura and Japanese newspapermen were entertained by local businessmen and other dignitaries during their stay in New Hampshire for the peace conference. Tree is located at the Gen. John Stark Memorial in Stark Park. Lancaster – boyhood home of Henry Willard Denison, chief legal counsel to the Japanese Foreign Ministry, who accompanied the Japanese delegation to Portsmouth in 1905. Tree is located in Cross Park opposite the Weeks Public Library. Col. Edward Cross was commander of the famed NH 5th Regiment during the Civil War and was Denison’s father-in-law. Meredith – where Jutaro Komura spent a summer “rusticating” on a local farm between semesters at Harvard. Littleton – host to a 2015 NH Humanities Council program, “Teddy Roosevelt’s Nobel Peace Prize” presented by Charles B. Doleac, president of JASNH and chair of the Portsmouth Peace Treaty Forum. To receive a Portsmouth Peace Treaty Living Memorial Cherry Tree, towns must agree to care for the tree, to host the NH Humanities Council program that explains the Treaty history, and to commemorate Portsmouth Peace treaty Day on September 5th by ringing bells each year at 3:47 pm on that date, the day the Treaty was signed in Portsmouth in 1905. Portsmouth – Temple Israel, founded in October 1905 after its founding members were among the Portsmouth merchants who welcomed the diplomats to Portsmouth and, as Russian-Jewish emigres, were the only townspeople who could speak Russian to the delegation. In 2012, the 100th anniversary of the gift of the iconic Washington DC cherry trees to the US by Japan, the Japan-America Society of New Hampshire (JASNH) learned that those famous trees were a direct result of the Portsmouth Peace Treaty, negotiated in Portsmouth NH in 1905, ending the Russo-Japanese War. Research showed that the Mayor of Tokyo, Yukio Ozaki, who facilitated the cherry tree gift, described in his autobiography a desire to thank the US for its role in ending the War. That conclusion resulted in a 2012 op-ed in the Washington Post by the Ambassador of Japan to the US and the JASNH being designated to receive cherry trees descended from the Washington trees in commemoration of the 100th anniversary of the diplomatic gift. 2015 is the 110th anniversary of the Portsmouth Peace Treaty. In addition to the planting of the cherry trees and the Portsmouth Peace Treaty Day bell-ringing ceremony on September 5th, the JASNH will be updating the exhibit at the John Paul Jones House Museum with new artifacts and details about the cherry trees and the legacy of the Treaty commemorations since the 100th anniversary in 2005.